Very nice and cozy house with 4 suites (air conditioned split new) in buziano style (glass and wood). Fully equipped and furnished and with a fantastic leisure infrastructure. Main house composed of 2 floors. 2 Canadian suites (split air and ceiling fans) and a balcony with lovely views of the Geribá lagoon and lots of ocean breeze. Lounge with two environments (living and dining), bathroom, kitchen and pantry and delicious and large balcony. 2 suites (also with ceiling fans and new split air conditioning) with balcony and view to the lighted pool, sauna and beautiful lawn. wi fi and cable TV. Recreation area with swimming pool (night lighting), steam room, shower, ample lawn, barbecue and wood oven in separate and covered area and small tree house (kids love it!). The sensation described by the guests is of being in a small and exclusive inn, with privacy including between them and at the same time, great and warm spaces of collective coexistence. 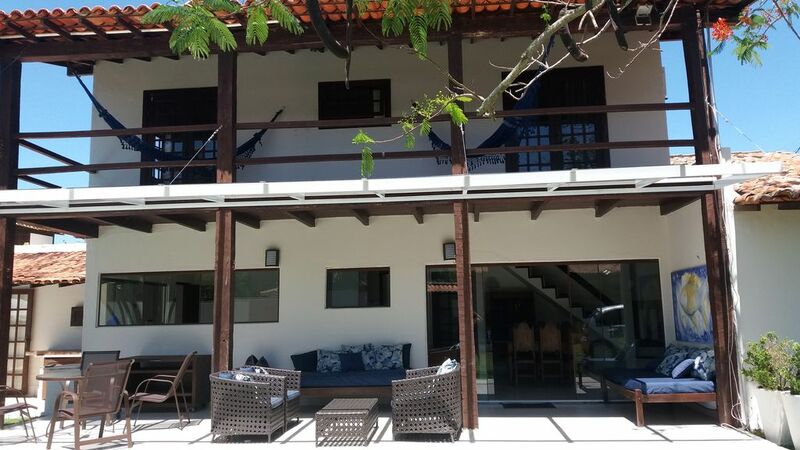 The location is super privileged, 100m from the central Geribá beach. Quick access to supermarkets and commercial utilities and healthy distance from the center. With the tranquility and security of a guardhouse 24 hours directly in front of the main gate, but with the privacy and comfort of an exclusive leisure area for you, your friends and family. Our experiences with landlords have been great and we hope your stay is as pleasant as possible. If you are interested in the rental, send us a WhatsApp or make your call (we do not guarantee agile answers) and guarantee fun and special moments with your family and friends. BEDDING AND BATHROOMS MUST BE TAKEN BY THE GUESTS. Noble location! The house is located in the central part of Geribá (Gravatás Street), about 100 meters from the beach, between the sea and the lagoon. The access entrance to the property is the second entrance of Geribá, next to CHURCH NOSSA SENHORA DESATADORA DOS NÓS, with ample commerce such as: supermarkets, pharmacies, gas station and others. A melhor opção de lazer para a sua família! Ampla e aconchegante, com total infra-estrutura e bem perto da melhor praia de Búzios! Leia, avalie e compare! Os hóspedes adoram! Conta-se com a assistência do caseiro para o funcionamento geral e a manutenção da área externa. Para a manutenção interna durante a estadia, o hóspede pode contratar o serviço (adicional) de diaristas indicadas por nós.